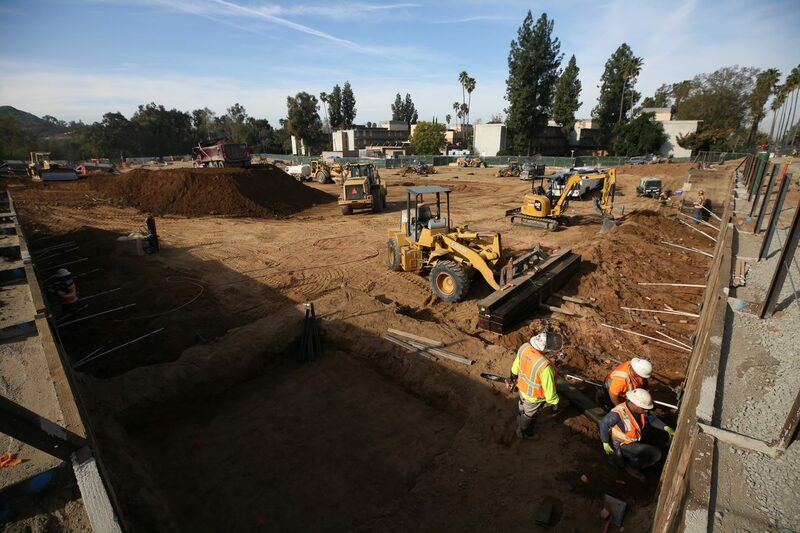 On a sunny morning at the north end of UC Riverside, bulldozers and dump trucks are busily grading dirt while construction crews put together a frame foundation for the campus’ newest housing and dining complex. The Dundee Residence Hall and Glasgow Dining Project, which began construction in December on Linden Street near Aberdeen-Inverness Residence Hall, is a first step in a major expansion of campus housing. The project consists of three structures on approximately 4.5 acres: a 51,000-square-foot, two-story dining facility and two seven-story residence halls totaling 176,000 square feet. The residence hall will accommodate 820 beds while the dining hall will seat 830 diners. Construction work is continuing on the Dundee-Glasgow dining and residence complex. (Stan Lim/UCR). The buildings will be completed by fall 2020 and will be followed by an even more ambitious project: the North District Development. Located on the other side of Linden from Dundee-Glasgow and bounded by Canyon Crest Drive and Blaine Street, the North District will provide thousands of new beds for undergraduate and graduate students on a 50-acre site. The shuttered Campus Crest Family Housing Complex will be razed to make way for the project which will be built in multiple phases, starting later this year. The first phase, which includes about 1,500 apartment beds plus improvements to the campus entrance at Aberdeen, will go to the UC Regents for approval in May, said Raoul Amescua, UCR’s executive director of Real Estate Services and Asset Management. The project will break ground in July and is expected to be completed by fall 2021, he said. UCR will move forward later this year with the first phase of the North District project. Future phases will be built based on enrollment growth and demand but include up to 3,575 beds, a 400-seat dining facility. and new campus gateways at Blaine and Canyon Crest, and Canyon Crest and Linden. “UCR is growing and these projects will support that growth,” said Jacqueline Norman, UCR campus architect. 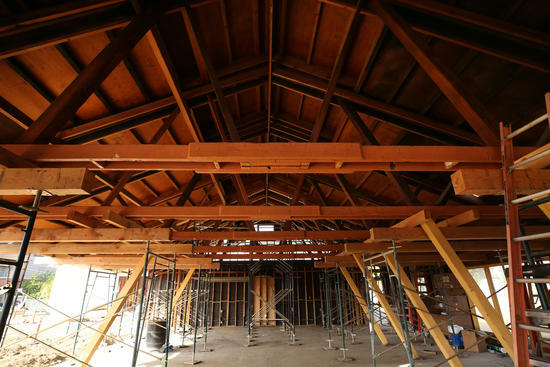 Another major project that began construction last year is the renovation of the 101-year-old Barn at the southeast end of campus. The $29 million project will expand and refurbish the building that began as a horse stable, served as the first dining hall on campus, and later became a popular concert venue and restaurant for both campus and community. The renovations include a refurbished Barn building with increased seating capacity, along with a new outdoor patio for diners and a significant new live entertainment venue. It will also include a reconstructed Barn Theater, a faculty/staff dining building and restroom building. The new 16,425-square-foot facility is expected to be open by October 2019. Work began at the end of January on a $60 million renovation project at Pierce Hall that will replace old mechanical, electrical, and plumbing systems, expand restrooms on all floors, and update fire alarm systems. The project will also modernize the 114,266-square-foot facility, built in 1966, with new class laboratories that will support STEM programs. The project is expected to be completed by June 2021. An outdoor sculpture, located on a 5,000-square-foot area between the Arts and CHASS buildings, began construction in March. The project by artist Roy McMakin will feature a kinetic steel sculpture, sculptural concrete benches, and landscaping that includes Cottonwood trees. The piece, designed to be functional as furniture and thought-provoking as art, is expected to be complete by mid-June. A campus committee proposed the project as part of an effort to provide more public art at UCR. The $12 million project — a joint effort with the Riverside Transit Agency — will create a central bus hub by extending University Avenue farther into campus. It will feature a six-bay bus plaza, a sculptural canopy, and benches. A horse-shoe-shaped roundabout will allow more buses to enter and exit campus faster. Construction will kick off in late spring with the transit center expected to be operating by fall. The campus is taking advantage of the construction of the Mobility Hub to redesign nearby paths and roads to make them more pedestrian-friendly. The project will close vehicular access to North Campus Drive and create a gateway plaza. The improvements are expected to be completed by early 2020. In April, work will begin on the $22 million Plant Growth Environments Facility near Parking Lot 9 and between East Campus and Eucalyptus drives. The 30,300-square-foot facility will feature a combination of greenhouse and support space. It’s the first new greenhouse space built in 50 years and will replace older facilities with high-quality, modern space to support plant research that allow for better temperature control. The project is expected to be completed by September 2020. Located near the Arts and Carillon malls, the new 39,820-square-foot building will address a shortfall in classroom space with a 900-student capacity. It will also include lecture halls, multipurpose rooms, group meeting rooms, group study rooms, open study spaces and a dining venue. Construction on the $60 million project will begin in the fall and is expected to be completed by August 2021. The $27 million project, which will begin in July, will make key renovations to the 110,000-square-foot laboratory building. Improvements include replacing heating, cooling, ventilation, electrical, fire alarm and water systems. Renovations will also be made to the building interior such as expanded restrooms, an upgraded elevator and new laboratory equipment and telecommunications rooms. As with Pierce, the building will remain open during construction. Work is expected to be complete by July 2021. To meet the growing needs of the School of Medicine, the project will add an approximately 11,000-square-foot Clinical Skills and Simulation Suite in the Orbach Library basement. It will include features such as mock exam rooms, simulation rooms, wet and dry instructional spaces, as well as control rooms with audio/video/telecommunications functions. The $30.5 million project will create a multi-story parking structure that can accommodate up to 1,200 vehicles. Construction will begin in December and finish by January 2021. Located at the east end of campus at the existing Lot 13, the new structure will meet growing demand for parking space and make up for parking lots recently closed for projects such as Dundee-Glasgow. This project provides $7 million worth of earthquake-safety upgrades to the university-owned Falkirk Apartment Complex on Canyon Crest Drive.